IN STOCK AND NOW SHIPPING WHILE SUPPLIES LAST! This is an exact reprint but with a new cover by Brux. Only 200 of the 2nd edition printed. ... an incredible soft-cover book from the creators of We Belong Dead magazine! We have very few copies. A labour of love, this gorgeous large format softback is FULL COLOUR throughout and has to be seen to be believed. With a Foreword by House of Hammer's Dez Skinn and an Afterword by Alan Frank. The first edition original publication sold out in 3 months. Limited reprint (only 200 printed) with a brand new cover by Brux. Ever heard of Monster Kids? Well, this is the book for you! 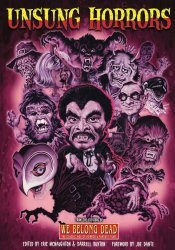 '70s Monster Memories, published by the producers of the horror magazine We Belong Dead, covers every memory a Monster Kid or fan can have from the '70s. From the great Aurora Model Kits to Zombies, no stone is left unturned. Beautifully illustrated and written for fans by fans, this book will not only bring back memories, it will help the monster kids of yesterday create the monster kids of tomorrow! Weight: 5 pounds. Dimensions: 11 3/4 x 8 1/4 x 1 inches. Edited by We Belong Dead editor Eric McNaughton. Foreword by Dez Skinn. Afterword by Alan Frank. 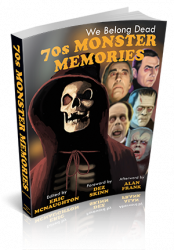 Please note the following correction to what is printed on the inside cover of this book: Monster Memories is a trademark and copyright 2018 of Don and Vicki Smeraldi/House of Scary Publishing/MyMovieMonsters.com. It has been used in interstate and international commerce since 1991 and is the title of our annual magazine presented by Scary Monsters magazine.